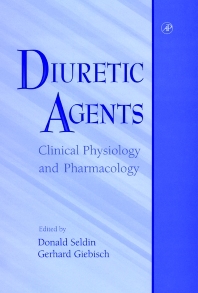 The only comprehensive work to cover all aspects of diuretic agents, the book discusses the pharmacology and toxicology of diuretic agents as well as the physiological effects. Experts in the field present the principles and experimental approaches for the study of interactions between pharmacologic compounds in relation to specific target organs. Diuretic Agents contains information on the mechanisms of action and application of diuretics, and details FDA regulations and pharmaceutical industry guidelines. Researchers in physiology (especially renal), pharmacology, and toxicology. Alpern, Giebisch, and Seldin, Renal Electrolyte Transport and Its Regulation. Herbert, Physiology of Diuretic Action. Freidman and Hebert, Site and Mechanism of Action of Diuretics. Navar, Renal Hemodynamic Effects of Diuretics. Palmer, Extra-Renal Effects of Diuretics. Brater, Diuretic Pharmacokinetics and Pharmacodynamics. Resistance to Diuretic Drugs. Ellison, Adaptation to Diuretic Drugs. Patel and Kirchner, Use of Diuretics in Chronic Renal Disease and Nephrotic Syndrome. Kirchner, Effect of Prostaglandin Inhibition on the Action of Diuretic Agents. Kirchner, Impairment of Diuretic Secretion. Salem and Kirchner, Albumin as an Adjunct to Diuretics for the Treatment of Edema. Enhancement of Diuretic Action. Ellison, Intensive Diuretic Therapy: High Doses, Combinations, and Constant Infusions. Ellison, Circulatory Support, Dopamine, and Dopamine Agonists as Adjuncts to Diuretic Therapy. Cleland, Interactions between ACE Inhibitors and Diuretics. Emmett and Seldin, Indications Edematous States. Emmett and Seldin, The Pathophysiology of Edema Formation. Emmett and Seldin, Use of Diuretics for the Treatment of Heart Failure. Emmett and Seldin, Diuretic Treatment of Nephrotic Syndrome. Emmett and Seldin, The Use of Diuretics in the Treatment of Ascites and Edema in Hepatic Cirrhosis. Silkensen and Ferris, Diuretics in Pregnancy. Silkensen and Ferris, Idiopathic Edema. Unwin and Capasso, Hypertension and its Treatment: The Place of Diuretics. Star, Water and Electrolyte Derangements: Overhydration. Palmer and Seldin, Diuretics in the Treatment of Metabolic Alkalosis. Beslau, Use of Diuretics in Disorders of Calcium Metabolism. Suki, Indications for the Use of Diuretics in Patients with Renal Impairment. Fenves, Toxic Agents: Drug Overdose, Poisons, Contrast Media. Rivera and Star, Sodium: Volume Depletion and Hyponatremia. Palmer, Potassium: Disturbances Associated with the Use of Diuretics. Palmer, Acid-Base: Disturbances Associated with the Use of Diuretics. Sakaee, The Effect of Diuretics on Ca Metabolism: Physiologic and Clinical Effects. Sakhaee, The Effect of Diuretics on Mg Metabolism: Physiologic and Clinical Effects. Toto, Metabolic Derangements Associated with Diuretic Use: Insulin Resistance, Dyslipidemia, Hyperuricemia, and Androgenic Effects. Toto, Allergic Interstitial Nephritis Due to Diuretic Agents. Subject Index.